That is tomorrow's business then. Eddie Jones has told his England players that he wants them to take Italy "to the cleaners". Can the Azzurri turn it into something a lot messier for England? We find out from 15:00 GMT. Here's what that Ireland win means in the grand scheme of things: they go top. One, however, would suspect not for long. England will move back above Ireland and Scotland with a win against Italy at Twickenham tomorrow. Anyone not backing a home win? Richard Petrie - BBC Sport's man in the Aviva Stadium - has filed his report on Ireland's win. 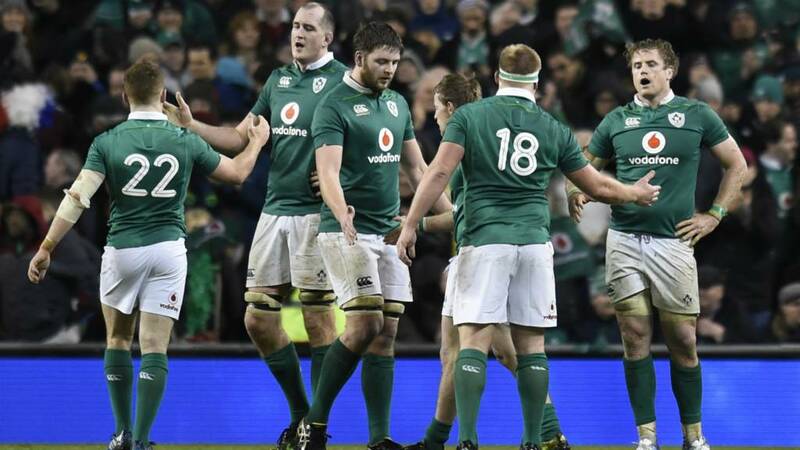 Joe Schmidt's side capitalised on the errors and indiscipline of their opponents. It was not the most stylish win - Garry Ringrose's occasional bursts aside - but the big W is all that matters. "We had a few chances on our line and didn't manage to convert, but with the way the weather was it was always going to be difficult. "It's a win on the cards and we're still in the hunt for this Championship. 70 minutes for Sexton will put him in good stead for games against the Welsh and English. "A win against the French is always a good one. A win and nothing else would do." The Irish handled almost two-thirds of the ball, enabling them to play nearly 75% of the match in the French half. The question before was could Johnny Sexton come into the side and perform. Ireland were very reliant on him and he delivered. But later on, the big plus was Paddy Jackson coming on and seeing the game out. For me, Sexton needs to lead the way for the British & Irish Lions in New Zealand later this year. I think it was a deserved win for Ireland. A workman-like performance. Last year, Ireland came off second-best in a grind-fest at the Stade de France. This was not a lot prettier, but they got the job done and keep the wagon rolling towards a final-day showdown with England. Before that there is a trip to Wales in a fortnight's time. That was a really clever kick by Zebo which forced France to get the ball into touch. The game is won, but can Ireland claim another try? Ireland are pulling the legs off this France side. Simon Zebo prods a kick into the France 22m. Remi Lamerat has to dribble it into touch. "Last play," says referee Nigel Owens as the clock goes red. Paddy Jackson knows that Joe Schmidt trusts him, so the decision to take off Johnny Sexton - who we know is carrying a few knocks - is a good one. Robbie Henshaw with a raking kick downfield forces Remi Lamerat onto the back foot. Lamerat returns fire, but Ireland are inching upfield with percentage rugby. Another green penalty, just inside the France half. Paddy Jackson takes his time as he punts into the France 22m. Off comes Conor Murray - named man of the match as he goes - and on comes Kieran Marmion. Paddy Jackson flips over the kick to deliver a gut-punch to France's hopes. A good deep kick-off, combined with a whole hearted chase pin France and Louis Picamoles down in their own corner. Camille Lopez boots clear, but only to his own 22m. Seven points difference, seven minutes left. Devin Toner gives away the penalty with a blatant off-the-ball shoulder charge on Julien Ledevedec. France with possession on the Ireland 22m. Can they pick the lock? They need a bit of razzle-dazzle from Gael Fickou or Noar Nakaitaci.